Today, many busy professionals order takeout, eat fast food, and dine in restaurants to avoid the hassle of cooking. However, these options are often unhealthy and become repetitive. On the other hand, there is a growing culture of people who enjoy cooking delicious meals. Urbanbite is a mobile service that connects these two groups by providing a simple marketplace for home chefs to sell their creations to individuals on-the-go. 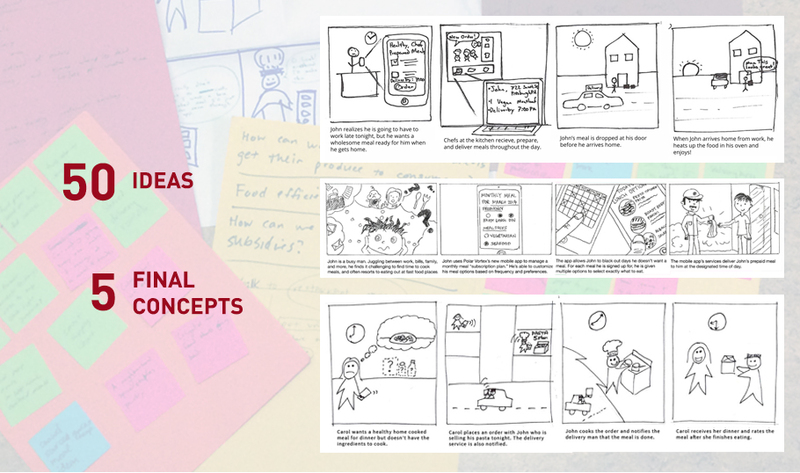 The project was part of a course called Mobile Service Innovation, where we were asked to invent a new service that could compete with already existing apps. It was completed from February to May 2014. How do we make it easier for busy urbanites to eat healthy, delicious food? Our challenge was narrowing down the problem space of healthy eating that hasn't yet been already solved by an existing service. We addressed this by using a PEST analysis, which reveals product opportunity gaps through political, economic, social, and technological factors. We also used visualized all of the inclusive stakeholders in the service ecology with a value diagram. We brainstormed over 50 ideas, and chose five of the most promising ones, including a meal subscription plan service, shared grocery orders, a vegetarian restaurant delivery service, "Etsy for food," and meal recommendations based on self-reported data. 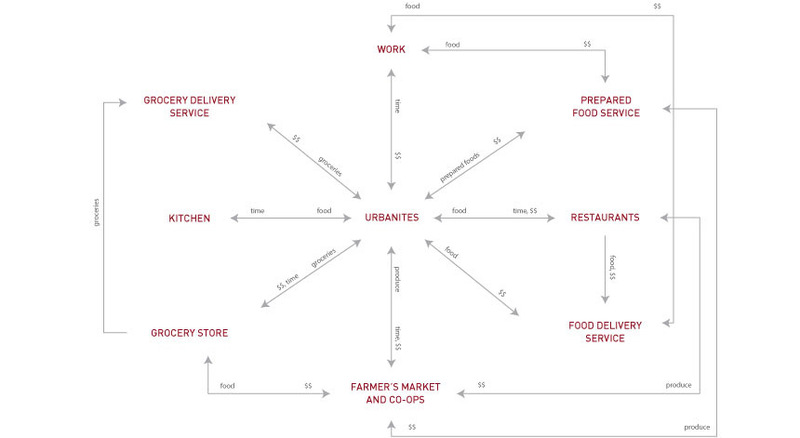 We rapidly showed our five concepts with relevant stakeholders (Whole Foods marketer, a chef at local health foods restaurants, two "foodies," and several studies). We discovered that the most positive feedback came with "Etsy for food," which we later renamed Urbanbite, and ultimately moved forward with this concept. Urbanbite allows skilled, passionate cooks to sell their own homecooked food on a digital marketplace. Busy urbanites can buy these prepared meals on their way home from work. This will provide reputation and an extra source of income for cooks while giving buyers the option of healthy, unique meals. We developed low-fidelity prototypes to brainstorm interactions and the types of screens that would be part of our service, each on the buyer and seller side. 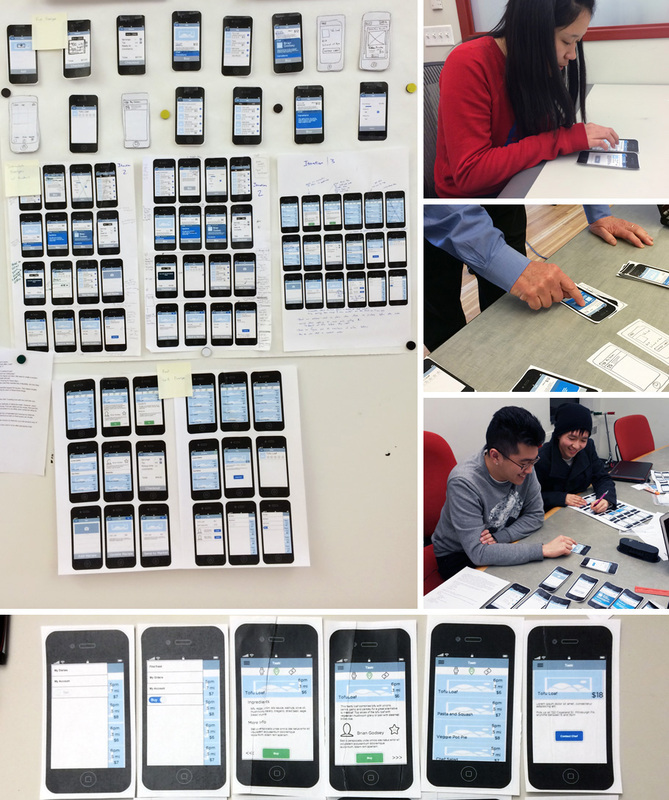 We performed several rounds of user tests with 10 participants. 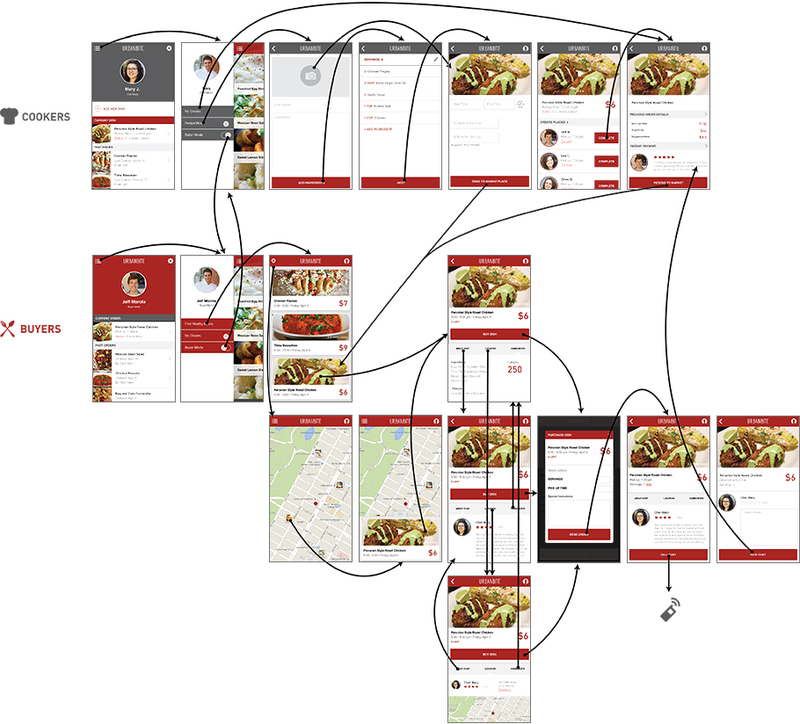 Based on our feedback (complicated selling process and usability issues), we iterated on our prototype. 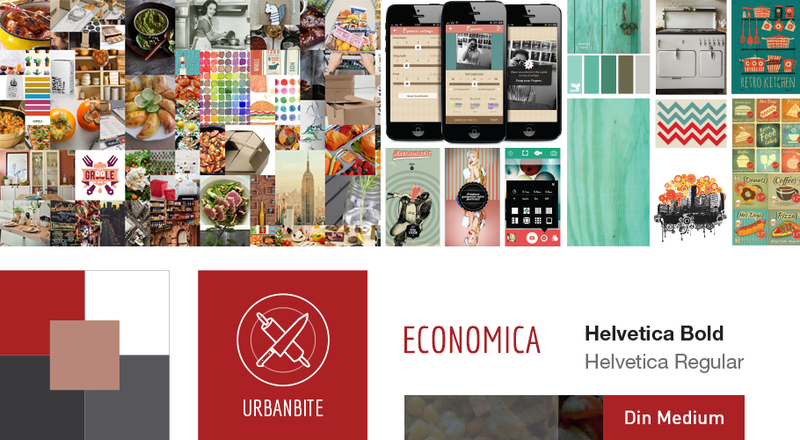 On our way to developing our hi-fidelity prototypes, we established the look and feel by first producing a moodboard. Initially, we wanted an urban, retro, and homemade look. After realizing that this made visual elements appear too amateur, we went with a modern, sleek look and combined this with simple colors and typography. We also defined our branding by producing a logo. To better understand the interaction and service design among our stakeholders, we asked: How exactly will a buyer and seller each go through the Urbanbite's service, from start to finish? 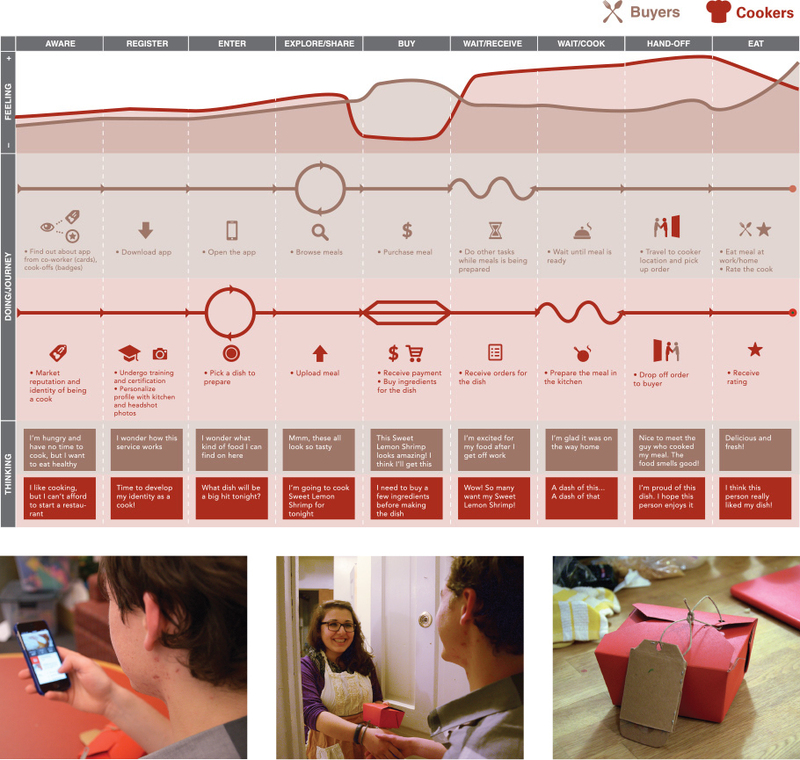 The customer journey map visualized this for us. We considered our users' feedback, integrated into our high-fidelity prototypes, and conducted another round of user testing. We created an interactive prototype using Marvel to perform these user tests.